Life as a yoga teacher is a welcome to paradox: Our glowing passion for yoga can burn us out, our connection with students can leave us feeling lonely and isolated, our spiritual call to unity takes place within a highly divided and competitive market space and our skills in empowering our students can become a power-trip in itself. 1) A theoretical talk addressing issues in the psychological or historical backdrop of teaching modern yoga. 3) Short yoga posture practices, meditations or group work integrating, digesting and operationalizing what we learn during the day. This training is limited to 10 people. Dates 2018: July 21 at 15.00 to July 28. At 15.00. Place: Metropolis Yoga is one of Copenhagen’s most beautiful yoga venues, situated at the Copenhagen water front only a 10 minute drive from the central station and 15 minutes from Copenhagen airport. The area is famous for its architecture and canals, the yoga venue has an ocean swimming facility around the corner as well copenhagens largest green area within walking disatance. You can bring your own food and eat in the kitchen or the balcony or go out for lunch in one of the local café´s. Accomodation is not provided at the yoga room but there are lots of hotes and AirB&B and hostels in the city to chose from. Price: 995EUR covers the teaching fee, tea and afternoon snacks. This course has 3 spaces available at a donation price for teachers who are travelling from abroad and are engaged in non-profit activities and/or work with vulnerable populations who cannot pay. Write directly to Birgitte if you feel you qualify for the donation program. Birgitte have been teaching yoga for 15 years, and have been practicing yoga and meditation for more than two decades. She has an MA in social Psychology from the University of Copenhagen and PhD in management from the Copenhagen Business School. Birgitte is trained as a process consultant using systemic and narrative frameworks and has been training in Big Mind facilitation since 2013 with her Zen teacher Genpo Roshi, currently on the advanced training program. She has taught, assisted and worked as an external examinatior in several yoga teacher training programs and have been teaching workshops for yoga teachers for more than a decade. With extensive teaching experience from universities, yoga studios and retreat centres, she communicates with ease and joy in both English and Danish. Throughout her career as a yoga teacher Birgitte has been at the front line of experimental and sensation-based approaches to yoga posture practice and have paved the way for a generation of Scandinavian yoga teachers who dare to think out of the box. When you have been accepted in the training you reserve your space by paying a 30% non-refundable deposit. The deposit secures your booking until 3 months prior to the training. The remaining amount is due by May 21. 2018. It is not possible to transfer your booking to later events, nor will your payment be refunded if you cancel after may 21st. 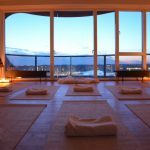 You are however free to sell your space to another qualified yoga teacher or offer it to someone on waiting list if you make other plans, provided that Birgitte has been consulted about this. Birgitte will of course refund the full amount in the unlikely event of a cancellation onher part. There is no exam in this course since our focus is on self-enquiry and process work rather than dissemination of knowledge. You will receive a course diploma documenting your full and active participation in all course days.